One reason I accepted Dave's invitation to join up here is because I spotted your name. You see, I caught the most excellent photo essay on another forum re: the gigantic walking dredges still in use in parts of this world, Mongolia I believe, in particular. And of course, being a woman, I was most interested in learning more about it as I read your flattering description of a sharp woman owner biz utilizing these giant dredges. I posted a reply there and you never returned to the topic. It is my fervent hope you won't be so reticent here. You promised to share the definitive study and result of effeciency of said dredges and what mistake in calculations we American's make in calculating effeciency when dredging. I'm all ears, and hope to find you re-capitulating your photo essay here for this forum's benefit, as well as addressing the poser that has me hanging by my ChickieToes about the mistake and the truth as you brought forth. Thank you, Steppe. Now I'll hunker down and wait. Mia Culpa - I've been preoccupied with lots of other things. Right, let me dig out some pics and get posting. And if you can post something about the Snowstorm Dredge (and its sluices) then we'll all be in for a treat. Hi Folks - I've lived in Mongolia since 1995. Then there was just one working dredge in Mongolia, and only a few dry mines. I've been documenting the placer gold rush since, now with 135 placer mining companies working 200 placer mines, and the Mongolian Dredge Fleet now has SIX large bucket line gold dredges and about 20 smaller bucket line dredges. I'm posting to share knowhow and ideas. And I am hoping someone will volunteer pics of the Snowstorm Dredge (especially its riffles) for me to include in the Tech Manual I've nearly completed for publication. First I'll try and post some pics of the gold dredges to see if you folks are interested. If you want to visit them it can be arranged! We'll see how it goes - I would like to discuss PLACER DRILLING later on, as there is a systemic error that means understimation of gold reserves beneath wet floodplains. This error seems to be ignored in the USA and Canada, but please realise that the 6 giant Gold Dredges in Mongolia exist ONLY because the systemic error was corrected by the soviets just before the command economy collapsed. Enjoy the pics and realise that - if I'm right - then large gold dredges would be profitable in USA and Canada on placers formerly written off as subeconomic grades. 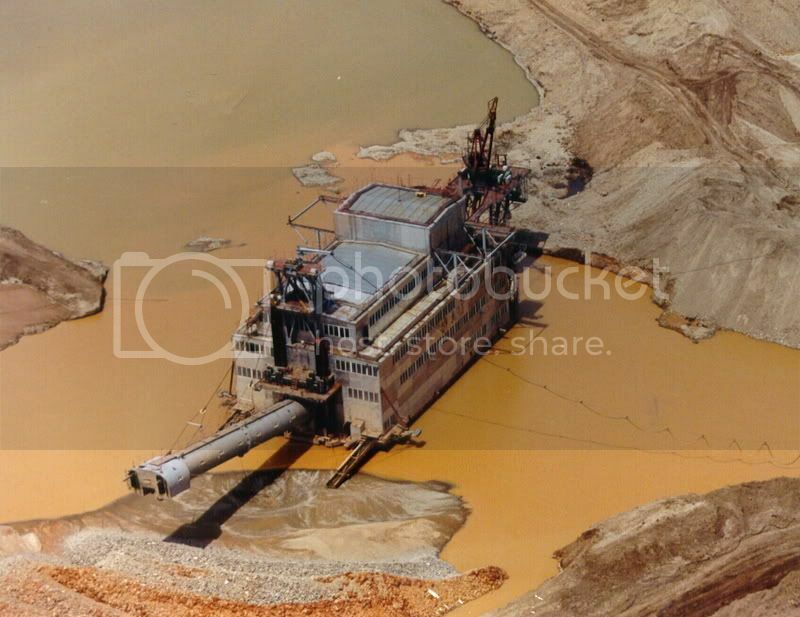 This is not an old picture in the USA it is of one of the 6 giant gold dredges in Mongolia. Its what we call the 'North Dredge' of Shijir Alt company, strictly speaking its Shijir Alt #1. The Mongolian Dredge Fleet operates for most, but not all, of the winter. Its minus 30-40 centrigrade in a normal winter! Here you can see smoke from the coal-fired bunker that via a boiler and pipes keeps the washplant working. Its the North Dredge again, thanks to Gerrit-the-Dredge for the pic. It sure is a BUCKET-LINE dredge, and here is the bucket-line raised clear of the water "just for the photo"! Hi, time to look at a second member of the Mongolian Gold Dredge Fleet. 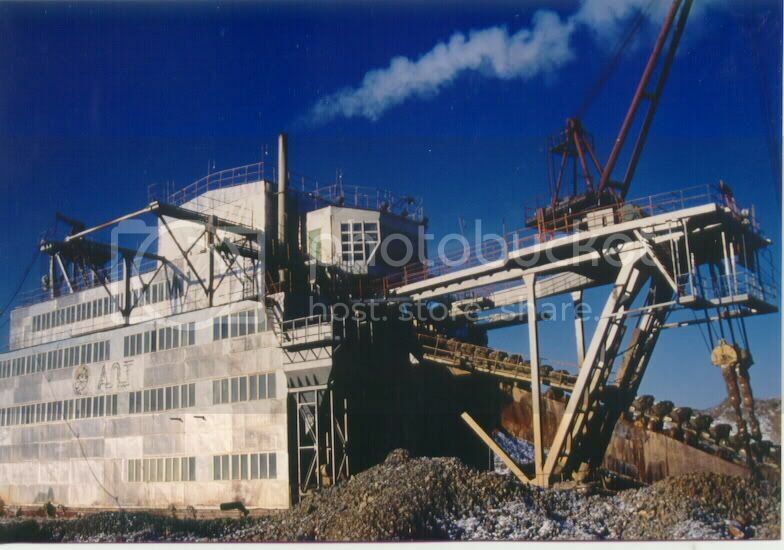 This one is further down the Tuul Valley and is known as the Bayangol Dredge. It was first owned by Hailaast JSC but this State owned enterprise could not pay for it fully so it was privatized and a Russian company Altan Dornod Mongol (Golden East - Mongolia) now own and operate it. 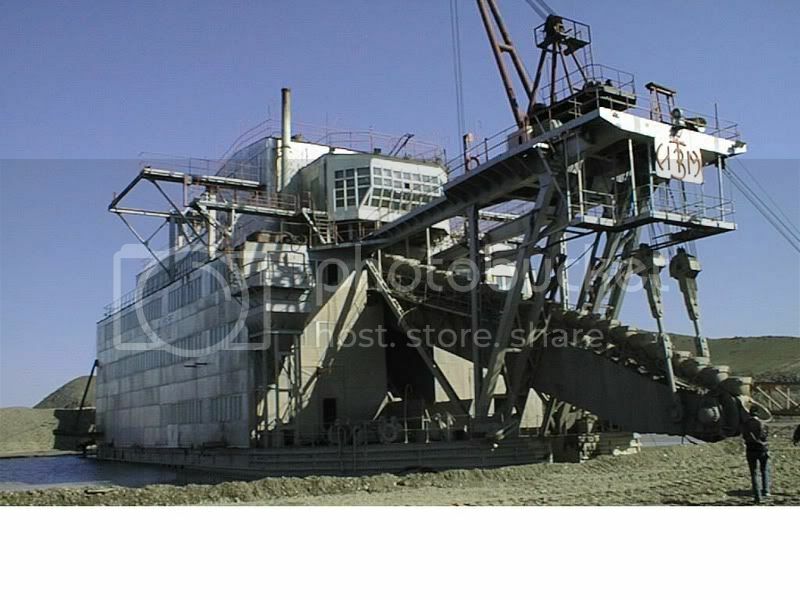 Notice that the entire dredge is winterized by cladding, and the rear stacker conveyor can be lowered onto the ground when the dredge is resting. Notice the dozer for scale! The Bayangol Gold Dredge is mining close to a fault scarp created in the post Neogene - that means quite recently. Between the dredge and the mountain is the Tuul River (out of sight). Over the years we've coined the term 'crocodile' for the ribbon of coarse oversize tailings dumped by the rear stacker, the crocodile being made of bananas! Here is the result of the South Dredge swinging on its spuds and singing... ....a crocodile made of bananas!